Who would have thought a year would fly by so quickly? Believe it or not, this is the last day of 2014. Generally speaking, I had a great professional year. I hope the new year will provide me with more projects and contacts. Expand my client network. Since starting my freelance business, I discovered that most of my clients and colleagues are based in Quebec. I feel that next year is a great time to expand my client network into other provinces or states such as Ontario, New Brunswick, New York, Vermont, or Illinois. Depending on where I network, I will either offer all my language services (editing, translation, writing, and all related tasks) or just a few. For instance, it would likely be more practical to offer editorial and writing services in Ontario, and more practical to offer editorial and writing services in addition to Spanish-to-English translation in the United States. Commit to a regular blog posting schedule. As you had likely noticed, my blog postings have been somewhat sporadic over the past few months because of sheer volume of work in and outside the language industry. Consequently, I haven’t been constant in writing regular posts. Like my Belgian colleague Elise Lignian, I will attempt to prepare weekly (or biweekly) posts throughout the year. Feel free to write me if you have suggestions for a topic. Reach out to communication firms and other businesspeople. Because most communication firms seek services from language professionals like myself, I would like to send a few offers of services to firms that interest me. Hopefully, this collaboration could become permanent. Secondly, I will make an effort to get out of my comfort zone and meet other businesspeople who may require or request my language services. Consult documents in my areas of specialty or interest. In mid-December, I joined a few LinkedIn groups focused on environment and ecology, arts and culture, and music. I would now like to consult documents in these and other areas of specialty or interest. I’ll start with reading newspaper articles, consulting specialized websites, and leafing through academic journals. I’ll keep an eye open for weekly group discussions on topics that appeal to me. Learn a new language or two. With the help of an E-180 member, I started learning some Russian prior to the holiday season. Unfortunately, it will not be possible to continue regular Russian conversations with this member. However, I would like to take Russian classes and brush up on concepts I learned before Christmas. I would also like to learn German. A choir buddy of mine gave me a list of German groups in the Montreal area in mid-December. I will look into them when I return to Quebec next week. Like other languages I learned, I have to do one thing regularly: read—and read a lot. And I also need oral practice, of course. There you have it: five attainable goals in the first three or four months of 2015. I have to remember to persevere. Once I start a project, I need to see it to the very end. What goals have you set for the year to come? I leave you with a store sign I saw in downtown Toronto earlier this week. Two things to note here. Primo, you leave for and return from vacation on (date), not “at.” Second, it’s a well-known fact that English is a title case fan. The problem is, title case can be abusive. 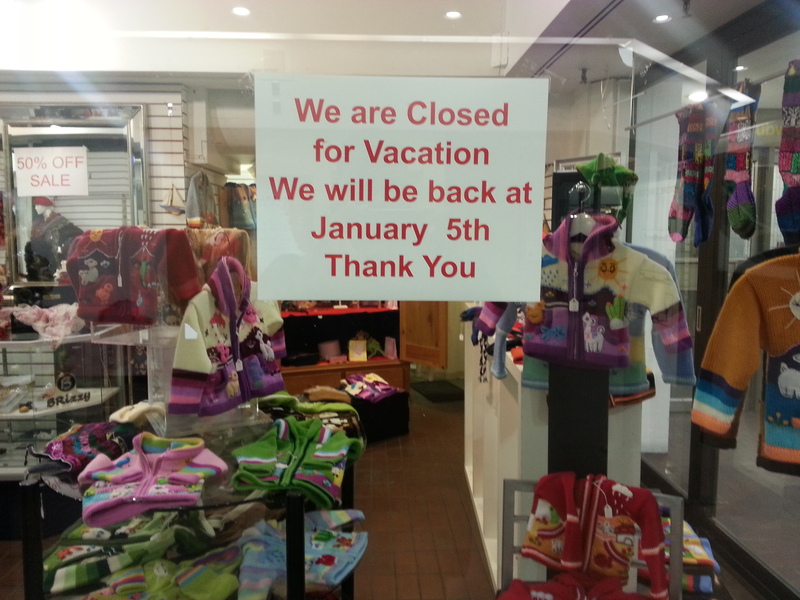 Why must closed and vacation be capitalized? Must we capitalize you in “Thank you”? As much as I’m not keen for making resolutions, let us resolve to write better in 2015. On that note, I wish you a healthy and prosperous new year! Thanks, Elise! I look forward to reading your posts as well.